The delta symbol means change over time. It’s handy to use this symbol, instead of writing the whole word like “change” or “difference”. Take a look at the following example to find out what I mean. In cell C1 and E1 we have headers called “Impression Change” and “Clicks Change”, which take too much space, so instead we want to change headers to “Impressions Δ” and “clicks Δ”. There are a few ways to insert this symbol. Some methods will only work with Excel and other Office applications while other methods you can also use with different applications, such as notepad. Go to INSERT >> Symbols >> Symbol. A new window will open. 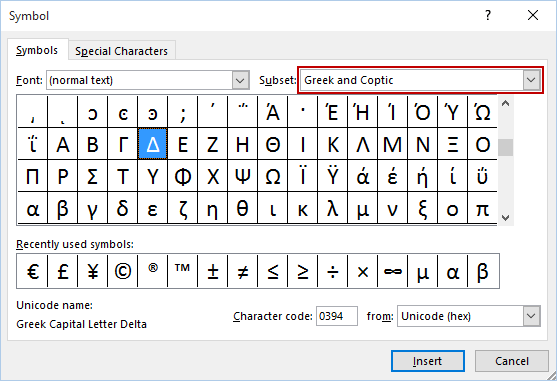 Because Δ is a Greek letter, choose „Greek and Coptic” option. It will move you to the beginning of the Greek alphabet. Click Insert and the symbol will appear inside a cell. The second method uses the application called Character Map. In Windows 7 you can go to Start >> All Programs >> Accessories >> System Tools >> Character Map. 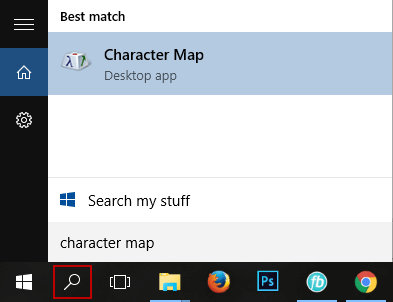 In Windows 10, just type “character map” inside the search window. Choose the application and look for the delta symbol. 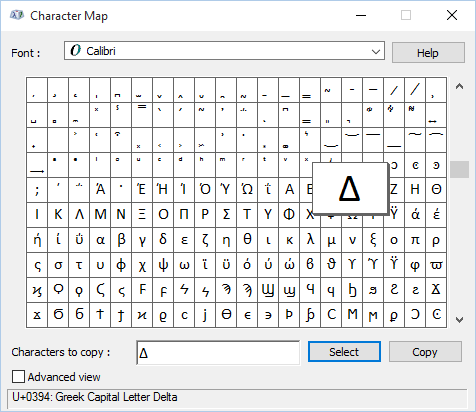 Searching for a particular symbol inside character map can be very time-consuming, so the good idea will be to click the Advanced view option and enter the name of the symbol you are searching for. From hundreds of symbols now you have 5. As you can see you have the delta symbol in the list. This is our final example.